On November 27th charities worldwide will be participating in #GivingTuesday and asking you to make a contribution. 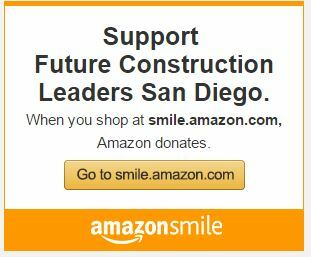 The Future Construction Leaders Foundation is joining this movement. Here are some reasons why and how we really need your support. Over the year, construction has added 330,000 jobs* in the US. Skilled tradespeople like carpenters, plumbers, concrete workers, electricians and bricklayers are in high demand. Yet a labor shortage plagues today’s construction industry. The Future Construction Leaders Foundation of San Diego is on a mission to educate today’s youth about these opportunities. From kindergarten to college, we have hands-on, free programs that expose students to various trades and the corresponding seasoned professionals who can guide and coach them. Block Kids Building Program: This year we’ll host 100 kindergarten through 6th grade students at this free event designed to stimulate imagination and drive interest in building. Camp NAWIC: We have a goal of hosting 100 8th-12th grade girls at this summer’s week-long, hands-on introduction to construction camp. Campers not only gain awareness about possible careers, they develop greater self-confidence, self-esteem and teamwork skills. Design Drafting Competition: This year our San Diego County high school and college participants will draft architectural drawings for a “high speed study zone.” Mentors and educators engage with the students throughout the process to enrich their learning. NAWIC College Scholarships: We grant at least two scholarships each year. One is granted to a student who has a parent employed in the San Diego construction industry. The other is for a female student pursing a degree in a construction-related profession. Become a Sponsor: Find the sponsorship level that is right for you or your company. To show our appreciation we recognize our sponsors in various ways including on our website, in social media, in print and at the event. Donate Online: Select a general donation or designate your support for a particular program. Don’t forget to see if your company has a match program. This #GivingTuesday please give as much as you can to ensure the next generation knows about the incredible opportunities available in construction.